Interestingly enough, two freshwater rainbow trout can spawn together and produce a sea-run steelhead while two sea-run steelhead can spawn together and produce a freshwater rainbow. Although steelhead have been documented to reach 55 pounds, an average steelhead is 8-11 pounds and in terms of steelhead fishing a 20 pound steelhead is a trophy in anyone’s book. One difference between salmon and steelhead is that salmon always die after spawning while a steelhead can be iteroparous and spawn more than once. In Oregon steelhead can be classified into one of two categories, stream-maturing (summer-run) steelhead and ocean-maturing (winter-run) steelhead. Adult summer-run steelhead enter the freshwater between May and October in a sexually immature state and require several months in freshwater before they spawn. Most of the Oregon steelhead in the Columbia River and its tributaries east of Hood River and the Cascasde mountain range are summer-run fish also known as inland steelhead. Columbia River steelhead west of Hood River and on Oregon coastal rivers flowing into the Pacific Ocean generally are the winter-run variety also known as coastal steelhead. Winter-run steelhead are generally bigger than summer-run fish and enter the freshwater between November and April sexually mature and ready to spawn. 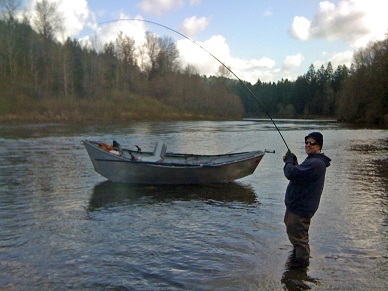 Plugs – Pulling plugs or hot-shotting is a traditional steelhead fishing technique invented almost 40 years ago. To this day it remains a deadly Oregon steelhead fishing guide technique that typically results in vicious strikes and aggressive take-downs. Bobber & Jig – Another extremely effective steelhead fishing method for novices and experts alike. This technique is especially effective in low clear water conditions. Drift Fishing – Another classic traditional steelhead fishing technique requiring lots of practice, an extreme amount of patience, and a highly sensitive rod designed to feel even the slightest of bites. Drift-fishing rigs often use pencil lead or slinky weights to get your offering to sink and bounce along a fast moving river bottom. The business end usually consists of a sliding drift bobber above a hook baited with scented yarn and/or eggs. Spoons and Spinners – Steelhead fishing by casting spoons and spinners can result in aggressive strikes in fast water. Often times one last cast through the hole with some “hardware” will be too much for a finnicky fish to resist. Fly fishing – Steelhead fishing with fly fishing gear such as one-handed fly fishing rods or two-handed spey rods. Sidedrifting – Typically involves steelhead fishing with bait and/or yarn sometimes below a small floating drift bobber designed to lift your presentation off the bottom slightly. When done correctly, side-drifting perpendicular to the current from a moving boat results in an extremely natural presentation. Bobber Doggin’ – Float drifting or bobber doggin’ is a steelhead fishing technique which is gaining widespread popularity amongst steelhead fishing guides in Oregon and elsewhere in the Pacific Northwest. This technique has actually been around for years and many think originated in British Columbia with the use of dink bobbers. Bead Fishing – Steelhead fishing with beads is another technique rapidly gaining popularity amongst Oregon steelhead fishing guides in recent years but also one that has been used successfully in Alaska and elsewhere for years for rainbow trout, arctic grayling, and other species. The small beads mimic the appearance of a single stray salmon or steelhead egg. This entry was posted on Wednesday, December 2nd, 2015 at 10:48 pm	and is filed under Steelhead Fishing. You can follow any responses to this entry through the RSS 2.0 feed. You can leave a response, or trackback from your own site.